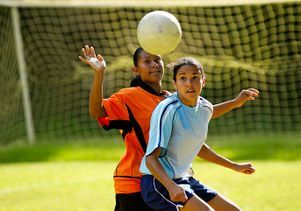 Girls' soccer at the high school level has one of the highest rates of concussion. Playing sports has many benefits, from getting exercise to learning teamwork. But as awareness about the long-term consequences of concussion grows, parents and athletes are starting to wonder whether some sports are worth the risk. 1. Concussions aren’t just a problem for boys. In sports with similar rules for boys and girls such as soccer, basketball and baseball/softball, girls have a higher rate of concussion than boys. Cheerleading is one of the sports with the highest risk of concussion injury, especially during practice. “There’s quite a lot of risk in cheering, mostly in the flyers,” said Dr. Christopher Giza, a professor of neurosurgery and pediatric neurology who directs the UCLA Steve Tisch BrainSPORT Program, referring to the high-flying stunts performed by cheerleaders. 2. Not all sports are created equal. The sports with the highest concussion rates overall among high school athletes are football, boys ice hockey, boys lacrosse, girls lacrosse and girls soccer, according to a paper in the American Journal of Sports Medicine. 3. Assess concussion risk by type of sport. Highest-risk (combat) sports: boxing, mixed martial arts and full-contact martial arts. High-risk (collision) sports: tackle football, rugby, ice hockey, wrestling and boys lacrosse. Moderate-risk (contact) sports: soccer (boys and girls), girls lacrosse, basketball and water polo. Low-risk (non-contact) sports: baseball, track and swimming. 4. When it doubt, sit it out. Coaches should remove an athlete from play if a concussion is suspected. A certified athletic trainer should evaluate the athlete and, if further help is warranted, the athlete should be referred to a licensed health care provider who has experience with treating concussions. Evaluation and treatment typically involves comparing an athlete’s baseline performance, monitoring the athlete and developing an individualized return-to-activity plan. 5. Don’t rush the return to play. Athletes should not return to play the same day after suffering a concussion. Instead, they should follow a six-step process: rest, light aerobic exercise (swimming, stationary bike), sport-specific exercise (running, balance activities), non-contact training drills (running plays, resistance training), full-contact training and return to competition. While recovery times will vary, each step generally should be at least 24-48 hours for youth athletes, Giza said. “It’s better to miss a week and heal fully than to go back prematurely, get another injury and miss a season,” Giza said. 6. Keep concussions in perspective. Giza agrees. It’s important for athletes to practice good technique, avoid unnecessary contact and use protective equipment properly, he said. In addition, rules should be enforced consistently, and concussions need to be identified and managed properly.